He loved his family, his neighbors, Georgia Tech, the Atlanta Braves, bowling (he was a great bowler), the Atlanta Journal/Constitution (where his dad had worked), Waffle House, Hickory House and the Picadilly Cafeteria, and Little Debbie. He didn’t get his final wish for Tech, which to see Paul Johnson get fired, but hey, there’s still time. If only he’d taken out a life insurance policy big enough to cover Johnson’s buyout. It’s being reported that Georgia’s made its first hire to replenish the defensive staff: Kevin Sherrer, the defensive coordinator at South Alabama this past season. He sounds like a man who’s followed in Jeremy Pruitt’s footsteps. Sherrer, 40, played tight end at Alabama from 1993-95, and was later a graduate assistant for the Crimson Tide (from 1998-2000), and was later the defensive coordinator at Hoover High School from 2005-09. 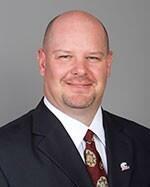 He then served as a director of player development at Alabama from 2010-12, before taking the job at South Alabama. The connections between Sherrer and new Georgia defensive coordinator Jeremy Pruitt are extensive: They were teammates at Alabama, worked together at Hoover, and were both at Alabama in recent years. Pruitt was at Alabama from 2007-2012 (the first three seasons as a player development coordinator), and was at Hoover from 2004-06. So it’s another guy who comes out of the Alabama high school scene and who has extensive experience with player development under Saban. Looks like Mark Richt is going all in on The Process. UPDATE: Hair does not seem to be a prerequisite for a position on Georgia’s defensive staff. As much crap as some of you like to give people for not being as negative… er, sorry, as realistic about Georgia football as you are, I haven’t seen any commenter here quaff the Disney Dawg Kool-Aid as deeply as this CFN writer has. I mean, geez, I’m as pleased as anybody about the Pruitt hire, “… but a midnight steal out of Tallahassee suddenly has Georgia football a title favorite in the eyes of many”? Whoa. You got questions? The College Football Playoff has answers. Well, some, anyway. There’s now a CFP official website, and somebody decided it was a good idea to set up a FAQ page there. What you’ll find there is about what you’d expect from the likes of Bill Hancock – a lot of high-minded stuff that really says less than what it sounds like. In fact, as is usually the case, it raises as many questions as it attempts to discuss. What criteria will the selection committee use to rank the teams? Selection committee members will have flexibility to examine whatever data they believe is relevant to inform their decisions. They will also review a significant amount of game video. Among the many factors the committee will consider are win-loss record, strength of schedule, head-to-head results, comparison of results against common opponents and conference championships. Each committee member will evaluate the data at hand, and then the individuals will come together to make a group decision. Will there be ballot votes to determine the top four teams? What about the other New Year’s bowls? The voting process will include a series of ballots through which the committee members first select a pool of teams to be considered, then rank those teams. Individual ballots will be compiled into a composite ranking. Each committee member independently will evaluate an immense amount of information during the process. This evaluation will bring about individual qualitative and quantitative opinions that will lead to each member’s vote. The first thing that comes across there is how incredibly subjective the process seems. The members can look at whatever they want and consider whatever they want. No common standards at all. Second, I presume all these folks have day jobs. To do what these answers suggest – more specifically, to do them right – strikes me as requiring a significant time commitment. Especially since the committee, for some unknown reason, is expected to rank the top twenty-five teams. We all know what a lot of coaches did when faced with a similar issue. The committee members don’t have SIDs to pass the ballots to for completion. Color me skeptical. And the reality is they already recognize that the members aren’t going to be able to devote full attention to the field, even if they won’t come right out and admit that. Will committee members have specific assignments, i.e. specific conferences? Yes, committee members will gather information on conferences and will provide reports on the conferences’ teams to the full committee, but all committee members will be expected to study all teams and be prepared to discern among all the information available, including video, to make evaluations. That’s a crutch, however you want to spin it. Then there’s the most amusing Q&A on the page. Why are athletics directors on the committee? The directors of athletics (ADs) have some of the best institutional knowledge of college football, and the selection committee is much stronger with their participation. Many ADs have careers spanning more than one conference and many have worked at the Football Championship Subdivision (FCS) level as well. The goal was to make the selection committee the best and strongest it can be, which is why ADs are included. Like all selection committee members, ADs will act in the best interest of the game. CFP, please. We know why they’re there. But have no fear. It’s all going to work out because transparency. Or something. “As possible” leaves a hole big enough to drive a Mack semi through. And they will. Look on the bright side, though. Think about how much broadcast fodder it’ll give ESPN. Then it all came crashing down in the biggest game of the season against hated rival Georgia. Patton was dragged down from behind, broke his arm when he hit the ground and just like that his season was done. In the blink of an eye Patton’s firs real opportunity to be an impact player was taken away. Suddenly that sad, lonely, empty feeling he felt as a freshman paled in comparison to what he felt as a junior. This is ordinarily the kind of story we used to read about some hapless kid suiting up in the red and black. Except it’s not. Sadly, the article left out my favorite Patton moment – the senior getting baited by Leonard Floyd, of all people, into committing a personal foul that pushed his team back just far enough to lead to a whiffed field goal attempt in a game that Florida lost by three. Again, that’s the kind of knuckleheaded moment you’d expect from our side. Except it wasn’t. You need to savor this stuff, people. I don’t blame Louisville’s new defensive coordinator for checking the temperature of Lamont Gaillard’s commitment to Georgia. I just wonder what his sales pitch is.